One of the world's best known athletics coaches is at the centre of doping allegations, according to a BBC investigation. 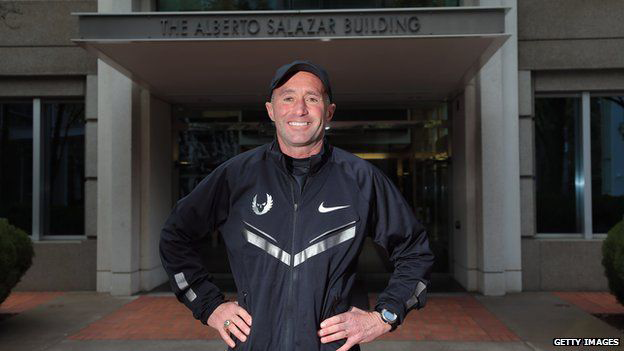 Alberto Salazar has been accused of violating anti-doping rules, including claims he was involved in doping US record holder Galen Rupp, in 2002. 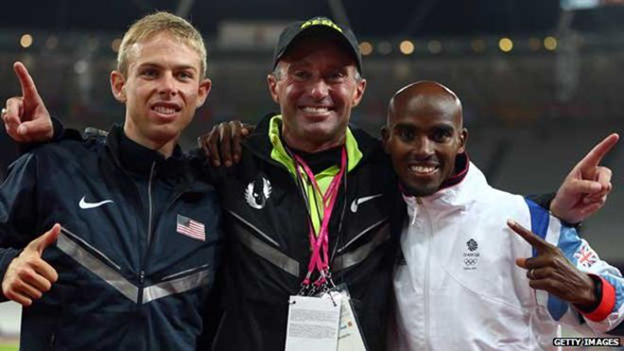 Rupp and GB Olympic gold medallist Mo Farah are part of Salazar's US stable, the Nike Oregon Project. There is no suggestion Farah has broken any rules. Salazar and Rupp deny any wrongdoing. Salazar is a US athletics legend, who won the New York marathon three years in a row and ran himself unconscious in winning the Boston marathon in 1982. He is now one of the world's most successful coaches. The head coach at the prestigious Nike running camp based in Portland, Oregon, Salazar has worked with Farah since 2011 and has coached his training partner Rupp for 14 years. His coaching philosophy involves intensive training and the use of the latest scientific techniques. 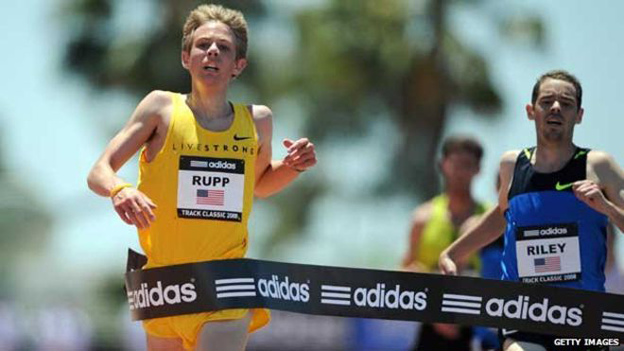 Rupp is the US 10,000m record holder and was 10,000m silver medallist at the London Olympics, behind Farah. None of the Nike Oregon Project (NOP) athletes has ever failed a drug test. But the BBC has heard claims about some of Salazar's methods including the use of banned steroids and unethical practices. The BBC is aware of at least seven athletes or staff associated with the NOP who say they have gone to the US Anti-Doping Agency (Usada) with their concerns, though Usada does not confirm or deny investigations. The allegations, which come from a number of former athletes and staff, will feature in a BBC documentary on Wednesday. 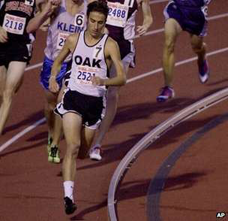 The investigation into the Oregon Project - which is a BBC collaboration with US journalism organisation ProPublica - heard claims that American distance runner Rupp had been given the banned anabolic steroid testosterone in 2002, when he was 16 years old. Steve Magness, who was Salazar's number two at the Oregon Project in 2011, said he saw a document showing Rupp's blood levels, which said the athlete was on "testosterone medication". "When I saw that, I kind of jumped backwards," Magness said. "Testosterone is obviously banned... everybody knew that. "When I looked a little further I saw it was all the way back in high school - and that was incredibly shocking." Since 2003, Wada (World Anti-Doping Agency) rules have stipulated that athlete support personnel involved in doping someone as young as 16 could be liable for a lifetime ban. Magness claimed when he questioned the coach about the document, Salazar said it had been a mistake. The 30-year-old left Nike after the 2012 London Olympics and went to Usada with his story. Salazar declined to be interviewed for the programme. But in a statement he told the BBC the legal nutritional supplement Testoboost had been incorrectly recorded in the document as "testosterone medication". He added the "allegations your sources are making are based upon false assumptions and half-truths in an attempt to further their personal agendas". Rupp, who is one of America's most drug tested athletes, strenuously denied ever using testosterone or testosterone medication. The 29-year-old added: "I am completely against the use of performance enhancing drugs. "I have not taken any banned substances and Alberto has never suggested that I take a banned substance." 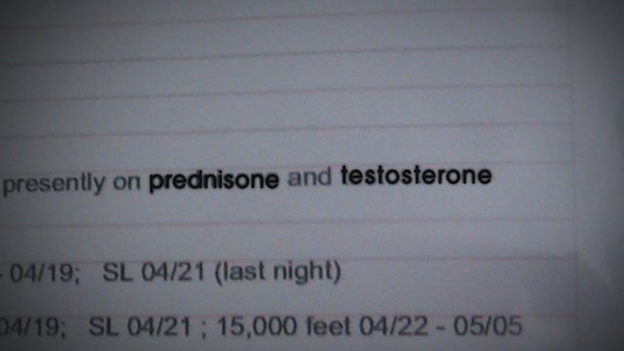 The programme heard claims that testosterone was seen on several occasions by athletes and staff, including a massage therapist at an altitude training camp in Utah in 2008. The therapist was allegedly told by Salazar the testosterone was for his own use for treatment of a heart condition. The BBC spoke to several cardiologists who said treating a heart condition with testosterone would be highly unusual. The programme will broadcast claims that Salazar tested testosterone cream on a human subject, to find out how much it would take to trigger a positive drugs test. Salazar is said to have told others he had carried out this experiment to safeguard against his athletes being sabotaged by rivals surreptitiously rubbing testosterone on them in order to make them fail a drugs test. He did not respond to the BBC's questions on this. But in a statement, he said: "I believe in a clean sport and a methodical, dedicated approach to training and have never, nor ever will, endorse the use of banned substances with any of my athletes." People who were inside the Salazar stable have also told the BBC about the alleged use of asthma and thyroid medication for performance enhancement. 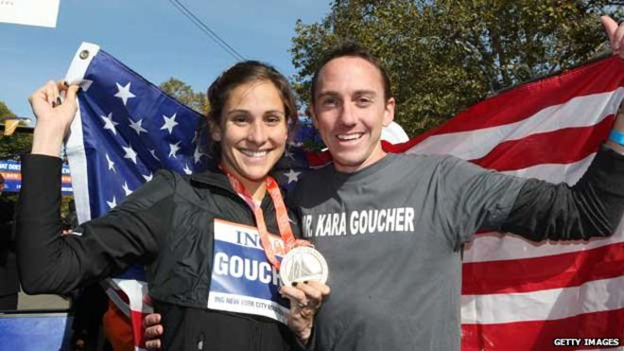 High-profile US distance runners Kara and Adam Goucher, were both former Oregon Project athletes. Kara Goucher told the BBC that Salazar had encouraged her to take the thyroid drug Cytomel to lose her baby weight in 2011, after the birth of her son. She claims the coach knew she did not have a prescription for Cytomel. Salazar said: "No athlete within the Oregon Project uses a medication against the spirit of the sport we love. Any medication taken is done so on the advice and under the supervision of registered… medical professionals." The Gouchers also spoke of alleged abuses by Salazar and Rupp of Therapeutic Use Exemptions (TUEs) in 2007 and 2011. TUEs allow athletes to use a banned substance or method to treat a legitimate medical condition. The Gouchers said Salazar tried to get a TUE for an intravenous drip for Rupp ahead of races. Kara Goucher said: "They wanted the IV for whatever reason to make Galen feel better, and they were manipulating the system to get it." Under Wada rules, the practice of IV drips is prohibited and anyone caught manipulating the TUE process to get one would be liable for a ban. Salazar responded: "I have never coached an athlete to manipulate testing procedures or undermine the rules that govern our sport… and follow the process for TUEs."
Rupp said: "Earlier in my career, WADA required TUEs for my asthma medication…the few other TUEs I have applied for and received related to the treatment of severe asthma flare ups." The Gouchers left the Salazar group and in 2013 took their stories to Travis Tygart, the Usada chief and the man who brought down Lance Armstrong. A runner who worked with the Oregon Project for several years, and wants to remain anonymous, said he was encouraged by a former Nike scientist to get testosterone and thyroid drugs because "this is what Alberto does". The runner said: "I talked to some people that know sport. They started to put words to it - that's micro-dosing - that is illegal. That's a smart way to cheat, just give yourself small boosts of testosterone to keep you in the legal limit. "I was shocked, like someone punched me in the stomach." Farah told the BBC: "I have not taken any banned substances and Alberto has never suggested that I take a banned substance. "From my experience, Alberto and the Oregon Project have always strictly followed Wada rules and if there is ever a question seek guidance from Usada to ensure they are correctly interpreting Wada's rules." David Howman, chief executive of Wada, said he was "disturbed" by the allegations. He added: "I would be not only disturbed, I would be very disappointed and that's why I think it needs to be scrutinised by us as an independent body." The documentary also investigates claims about Allan Wells, who won gold for Britain in the 100m sprint at the Moscow Olympics in 1980. It heard claims Wells had been using steroids which were sourced from the British Olympic team doctor, Jimmy Ledingham - claims which were strenuously denied by Wells' lawyer. The lawyer added: "It is not true our client had used any banned performance drugs…at any…time." The programme also exposes the frailties of current drug testing procedures, with its reporter embarking on a 14-week experiment involving microdosing EPO which went undetected.